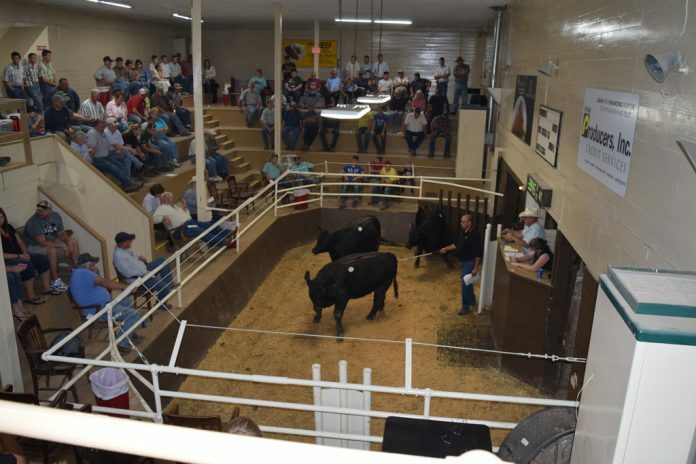 COLUMBUS — United Producers held its sixth annual fat cattle show and sale at its Bucyrus, Ohio, facility June 27. UPI employees Scott Acker, Terry Blythe and Trent Ward judged pens of three beef steers, beef heifers and Holstein steers based on a desirable combination of muscling and finish. Plaques and cash were awarded to the top three pens in each category. The winners were: grand champion steers; Alvin Horst Jr., of Shelby; reserve grand champion steers, Andy Stirm, of Bucyrus; third place steers, Tom Henline, of Pemberville, and Andy Witker, of Bradner. Grand champion heifers went to Andy Thomas, of Plain City, Ohio; reserve grand champion heifers, Hartley Grain Farm, of Bellevue; third place heifers, Bass Beef, of Ada. Grand champion Holsteins went to Kaple Farm, of Tiro; Reserve grand champion Holsteins, Jeff and Tyler Cramer, of New Washington. Third place Holsteins went to Jason Wiles, of Creston. There were 120 pen of three entries from 54 consignors at this year’s show and more than 360 head of cattle sold. Holstein steers brought a high of $110.50 per hundredweight, beef steers brought a high of $132 per hundredweight and beef heifers brought a high of $131.25 per hundredweight.